In many UHV-systems there is a chronic lack of sample plates, often due to a shortness of storage spaces for them. Our currently largest of many sample receiver and storage solutions is the pictured RECOMSTAGE(D20). It consists of four stacks, each stack featuring five double spaced slots for SHOM flag style sample plates or SHBSOMHM sample holders. The sample plates are held in place by two beryllium copper leaf springs. "We ordered a custom-based ambient pressure XPS endstation from Ferrovac to study solid-liquid interfaces. Ferrovac did an excellent job both in terms of engineering and assembly and delivered the product on time. This endstation is very productive from the very first day it was connected to the synchrotron at the Swiss Light Source." This configuration example provides every necessary degree of freedom for full control over your samples in a UHV environment and sample temperatures down to 10 Kelvin by combining a "Boomerax" high precision XY stage with our MZ linear Z-axis drive and incorporating a well-established and very stable Janis ST-400 continuous flow cryostat. ST-400 He-Flow Cryostat :: As one of the the simplest methods of providing cooling in an ultra-high vacuum environment, the ST-400 has several features that are specific for UHV requirements. MZ Z-Translator :: The optionally motorized linear Z-axis drive comes into play for accurate lifting and lowering. It's highest quality edge welded bellows fulfill the strictest requirements in terms of leak tightness and durability. Boomerax MXY Module :: For smooth and exceptionally precise adjustment, it offers a resolution of 2 microns when manually driven and even higher resolutions when motorized. Sample Environment :: Sample Heating Stage assembly for flag style sample plates, featuring a standard rectangular PBN/PG heater. Sleeker and even more refined, yet equally precise and consistent, the new version of our DRVRM manual linear drive for RM and GMD sample transporters is also considerably more affordable than the previous model. The DRVRM's hand wheel enables especially accurate manipulation, it's high precision spindle drive is coupled to the outer magnet of the sample transporter and controls it's linear motion. Rotation can easily be locked or undone with a locking screw. We constantly strive to make your daily work as simple and straight forward as possible, which in this case led to the development of our new LSA3.0 Ion Pump Controller. It's new and advanced features are the direct pressure display in mbar (rather than a current value that had to be converted), an alarm function for low battery and/or high temperature as well as the built-in temperature measurement and display for a Pt100 sensor, making it the essential controller to have for our LN2-cooled VSN40S UHV Suitcases. We are launching a less complex version of our sample transporter with independent rotary motion of the two inner shafts. It's main bearings are of the sliding type to ensure a long lifetime and smooth operation, even over the course of numerous bake out cycles. The new and simplified design enables lower sales prices compared to our RMDG40 models. Complementing our heating solutions is the recently updated HSASM40-MD16(TS)-TSMDH-HSMDDCOM heater assembly for direct current heating of SHOMDC sample holders. Customizeable in it's lengths of travel and retraction, it's main element is the sample heating stage that's integrated into a complete assembly including a special DN40CF flange with linear/rotary as well as an electrical feedthrough. Our new EVEX40 watercooled evaporation source is an advanced technological concept, based on the well-established EV40FC evaporator for ultra clean thin film deposition. The great advantage this new design of the EVEX40 offers, is the very quick and easy in-situ exchange of the crucible as it is mounted on a SHOMEVCRW flag style sample plate. A swivable front lid offers easy access. All that's needed is a pincer-equipped wobblestick for quick exchange of multiple crucibles (e.g. for various materials) that can all be used with the same evaporation source. 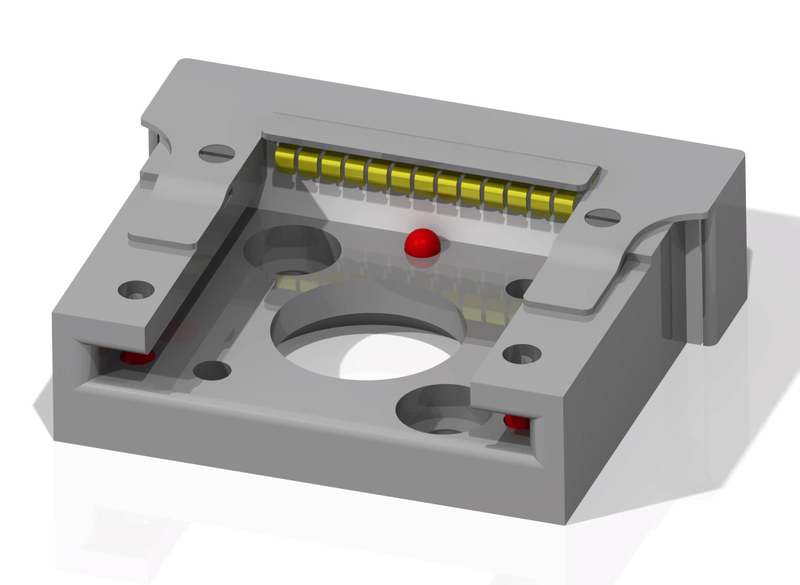 We have developed an even smaller, lighter and more cost efficient version of our UHV suitcase. The VSN40M is equally reliable yet especially practical wherever space is at a premium. The Mini NexGeneration UHV Suitcase is the ideal solution for carrying and transferring multiple samples at once under true UHV conditions from one instrument to another. The samples are held in a storage mechanism such as a stack of receptacles or a carousel. Should only a single sample holder need to be stored and transferred, this is also possible using a pincer grip, fork or similar instead of the storage option. Just like the standard size UHV suitcase, the VSN40M is designed as a modular concept so that it can be adapted to suit your specific requirements. We presently have various EXSICA Vacuum Exsiccators on stock and available with a 10% discount*! So take advantage of the current savings and quick delivery times. Our Vacuum Exsiccators are the ideal solution for storing sensitive items under vacuum or in a controlled atmosphere. Transparency of the polished PMMA as well as the storage box sets ensure a clear view and easy organization of samples. After pumpdown with a membrane pump, the exsiccator holds a base pressure of approximately 25mbar over a period of several months. A pressure meter roughly indicates the vacuum level. The box can be filled with dry Nitrogen or Argon if desired. An overpressure valve is provided for safety reasons. Standard and portable versions of the vacuum desiccator as well as a complete portable system including a small membrane vacuum pump are readily available. This time around, our product of the month is an "old acquaintance". After freezing production of our EV40FC Evaporators in 2014, a limited amount will be ready for production shortly. Either available fully assembled or as a self build kit, make the most of the opportunity and contact us for more information. A rugged, versatile evaporator for a wide range of materials such as Ag, Au, Al, Ni, Co, Fe and many more. The evaporant is either placed into a tungsten crucible or the material can be directly evaporated from a rod. A removable front lid allows easy access to the crucible which can be pulled out for replacement by releasing one single screw. The filling volume of the crucible is up to 500mm3. The water cooled housing ensures ultra-clean film growth at base pressures in the lower 1E-10 mbar range. The EV40 is equipped with a manually actuated shutter. Specialised in the supply of precision parts and components suitable for UHV, we also offer top quality products for a wide range of other applications. Brand new in our line-up of heating solutions are three versions of the HSOMRAD sample heating stage. Prepare your samples on SHOM flag style plates by inserting them into the shielded receptacle of the HSOMRAD heating stage. Three filaments rapidly heat the stage up to a maximum operating temperature of 1000°C. The HSOMRAD includes the heatable receptacle with heat shields and tungsten filaments, integrated into a stage that can easily be attached to one of our MD16 or MD40 Linear/Rotary Feedthroughs. As an example for a flag style sample holder for single crystals, the SHOMCH can be individually adapted to suit other monocrystalline types. This special flag style sample holder simplifies the process of mounting single crystals (type K005), it's four slits in the retaining plate ensuring safe and level clamping. If you use another single crystal type and/or need other dimensions, please do not hesitate to contact us. The VSCT40 dock paves the way for rapid transfer from a UHV Suitcase to your UHV system. Our portable UHV-Suitcases are the most refined and easiest way of transporting samples under true UHV conditions between instruments in different locations. In order to also greatly speed up transfer of your samples from the UHV-Suitcase into the UHV- System, our VSCT40 transfer chamber establishes sufficient vacuum within a fraction of the time needed when baking out conventionally. Vacuum in the VSCT40 is created using a turbo pump as well as a cryogenic pump. The RMHS40-IVBR-TSRMBD serves as a vertically mounted manipulator, commonly used for sample insertion into cryogenic SPM's. The layout of these systems calls for long travel and precise manipulation. The RMHS40 sample transporter features a specially treated hollow shaft that offers the necessary straightness, lighter weight and crucially it also avoids excessive thermal conduction. Strongly recommended for safety reasons is the inclusion of an IVBR in-vacuum brake that prevents the inner shaft from suddenly dropping, should the magnetic coupling be let go by accident. Facilitating the handling of such long sample transporters, the TSRMBD belt drive provides quick elevation over longer distances using it's belt. Two hand wheels enable precise linear as well as rotary positioning. Application example (with UHV cube) shown: Scanning tunneling microscope setup operating in UHV, very low temperature (T<0.1K) and high magnetic field (B>15T). The hollow shaft, belt-driven sample transporter by Ferrovac enables top-loading of the sample and tip holders from the transfer chamber (UHV cube) down to the STM head. Used to align transfer axes of manipulator-to-chamber or chamber-to-chamber systems, port aligners are indispensable for most sample manipulations and transfer mechanics in UHV. While all types of port aligner allow for angular and linear adjustments and compensation, the "HEX" models additionally enable lateral axis displacement. Thanks to this enhanced flexibility, the axis of for example a sample transporter can be aligned with two different sample exchange positions in just one setting. Hexapod port aligners are also especially sturdy. Also see our Special Offers for discounted stock items. Our RECOM receivers are a utilitarian component for UHV systems that operate with SHOM flag style sample plates. Machined from a solid block, they are available in a variety of shapes and materials to suit specific requirements like high heat resistance or non-ferromagneticity. We also supply matching SHOM plates in a great variety of materials. Secured in the RECOM by leaf sprung Ruby spheres, the sample plates glide over these point contacts with very low friction. RECOMs are the fundamental building block for a whole host of sample storage solutions such as revolving carriers for SHOM plates. Please contact us to find your matching off the shelf or customized sample plate receiver and/or storage solution. Using longer sample transporters, it can be hard or impossible to simultaneously look inside the chamber over the full length of travel. Thus alignment checking is a step-by-step process, making for cumbersome handling. Our new TSRMKG extension for remote manipulation is mounted on a guide rail for the sample transporter and enables full control while standing close to the system - for constant visual monitoring. The finishing touches to an all-round sample handling and storage solution were realized mid-year with delivery to the University of California following soon after. The system was developed in close collaboration between the engineering department of Ferrovac and Alexander S. McLeod and Michael Goldflam of the Department of Physics at UC San Diego. "Behold, [...] an infrared image now from our microscope, showing conductive metallic regions percolating during a metal-insulator transition in an oxide film at ~160K. Suffice to say we are happy everything is working for us now with the RECOMECs, load-lock and wobblestick, this hardware is enhancing our productivity quite a lot!" The system (pictured above) consists of a customized KS load lock cross and chamber, a WMG40 wobblestick with custom-made PGWMS pincer, a pair of MD linear/rotary feedthroughs equipped with eightfold RECOMSTACK sample storage stacks and the elementary RECOMEC13S receptacles and SHOMEC13 sample plates with electrical contacts. In very limited space, the approach to the interchangeable probe and sample plates is only possible at a 47° angle, with the probe also tipping forward. A special pincer design accounts for these issues, making access to and exchange of the samples a smooth affair. By simply twisting the wobblestick to one or the other side and back, the sample plate is held either straight for exchange with either storage stack or at an exact 47° for access to the microscope. To store, protect and easily transport your samples, the small-scale exsiccator EXSICA3P in combination with the PUM005 roughing pump is the ideal solution. The transparent (PMMA) panels provide a clear view of the contents for easy organization and the pump is mounted in a compact box that can be mounted/detached to an EXSICA3P desiccator - for on the spot pump down pretty much anywhere you are, as it operates on 12 Volts. So even if you're truly "in the field" you can for example plug it into your car's 12V DC socket adapter to run it. A mains power adapter is also included. Newly complementing our heating solutions are the modularly configurable resistive sample heating items presented below. The basic building block is the RECOMHTR1001 heatable receptacle for sample plates, that fits directly on top of a HTR1001 Boralectric™ resistive heating element. For the resistive heater to function proficiently and reliably at high temperatures, material choice and a thoroughly considered construction of the stage are required. The HSOMRHTR1001MD heating stage component is the intermediate configuration level, featuring both the heatable receptacle as well as the heating element, integrated in a stage that can be easily attached to one of our MD16 or MD40 Linear/Rotary Feedthroughs. The HSASM40-MD16(TS)-TSMDH-HSOMRHRT1001MD is the fully configured assembly, with the heating stage attached to a Linear/Rotary Feedthrough, mounted on a DN40CF-flange and includes wiring as well as the electrical feedthrough. Motorization of manipulators provides reliable, safe and precise movement, positioning and handling. Implemented in our motorized linear/rotary drives are the necessary prerequesites: a fine step resolution and a sturdy construction. Shown below is a sectional view of a stepper motor-driven linear drive for MD40 Linear/Rotary Feedthroughs, equipped with an optional stack of receptacles for SHOM sample plates. The motorized precision drive unit allows for easy, independent manipulation of the linear and rotary axis. Motorization of manipulators provides reliable, safe and precise movement, positioning and handling. Implemented in our motorized sample transporters are the necessary prerequesites: a fine step resolution and a sturdy construction. Where different users operate, automation is especially advantageous and also saves valuable working time. Shown in the video below is a stepper motor-driven linear drive for RM and GMD sample transporters. The motorized drive allows for automatic and reproducible extension of the shaft. Rotary motion is done manually. Pictured right is a motorized linear and double rotary drive with pincer grip for SHOM sample plates. The separate rotation of each shaft enhances operation of the pincer by being able to open/close and also rotate it. With immediate effect, list prices accross our ranges of Single Shaft and Dual Shaft Wobblesticks, as well as Dual Shaft Linear/Rotary feedthroughs have been reduced! For further updated prices, please see our pricelist. Linear motion of the shaft is controlled by a precision motorized spindle that is coupled to the outer magnet. The shaft is rotated via gear wheels that transfer the motion from a second stepper motor. Atomically resolved Graphene on Ni thin film, SiO2/Si substrate. We are introducing a simplified single shaft sample tranpsporter with superior slide bearing technology. Slide bearings ensure a long lifetime and smooth operation even after numerous bake out cycles, as proven by years of experience with our wobblestick manipulators. The new and simplified design leads as well to a generally lower sales price compared to the GMD40 models. Over the past couple of months, David put a lot of effort into developing our new website which was finally lounched in March. Besides the friendlier look, the new platform gives us great flexibility in presenting information and helps us to keep it's content up to date. Thank's David, for your effort and congratulations to the result! The transport of samples under true UHV conditions from one instrument to another, sometimes from one institution to the other, is an increasingly important task in modern surface science. Ferrovac is constantly extending its product range in order to provide tailor made solutions. We would like to present our new models of NEG/Ion pumped UHV suitcases optimized in size, cost and performance. EXSICA vacuum desiccator cabinets provide a truly “transparent” solution for storing delicate items under clean and dry conditions. The portable version EXSICA3P is presented here, intended to carry samples around under vacuum or in a controlled atmosphere. scattering of polarized soft x-rays"
A versatile heating stage for SHOM sample plates. The Positive high voltage applied to the sample, attracts free electrons generated by a tungsten filament which is placed on the rear side of the plate. With this very effective way of heating, temperatures of ~2000°C can be reached within a few seconds. Prices decreased by 10% & End of the year special offer [read]. Product presentation Sample Transporter for Wafer Handling FRKLIFT & Useful Accessories Port Aligner PA16, PA40, PA63 [read]. Subscribe to one or more of our newsletters using the form subscribe. Browse the newsletter archive. Redesign of the fully equipped UHV-suitcase. Bakeout panels and heaters were added, chamber geometry improved, a larger pumping port provided. Two new rotary drives, a DN16CF miniature rotary and a high precision, heay duty rotary drive are extending our product line. In collaboration with Pierre et Marie Curie University an X-Ray Spectrometer was designed and built at Ferrovac. The System was delivered in may and will be subsequently tested during this year. After the redesign of our classical Mott-Polarimeter the fist prototype was sucessfully installed to a test setup at the Federal Institute of Technology in Zurich, Switzerland. Performance tests are currently running, the preliminairy results look very promising. Ferrovac moves to an industrial site in Zurich Oerlikon: The Oerlikerhus. As the Ferrovac team of engineers and administrative staff is constantly growing, more space is required in general. Lab and assembly facilities are greatly improved. After three years of sucessful use at the Swiss Light Source, a second, identical UHV sample preparation System for the Elmitec-PEEM was installed at BESSY GmbH in Berlin. In cooperation with the Federal Institute of Technology (ETH) Zurich, the APE-Beamline of ELETTRA and the company Attocube Systems, a 5-axis positioning system for the relative positioning and scanning of a Fresnell lens and order shield aperture with nanometer precision is developed. The system will be used for spatially resolved photoemission and related experiments at the APE-Beamline of the ELETTRA synchrotron in Trieste. An ultra high vacuum system was designed to extend the sample preparation methods of the Photoelectron Emission Microscopes (PEEM) manufactured by Elmitec. Ferrovac moves to its new company site: Ferrovac GmbH, Winterthurerstrasse 457, CH-8051 Zurich. A complete set of accessories for sample manipulation has been developed. Rotateable sample carring platforms, forks, sample holder blocks and heating stages are readyly available. Please contact us for detailed informations. Increasing interest for a solution to transport and store samples under uhv conditions has led to the development of the VK40 portable load-lock. Please visit our new web pages. Ferrovac introduces new website with online product information and download of specsheets.